David L. Rebuck was nominated by Governor Chris Christie on April 29, 2011 to be the Director of the New Jersey Division of Gaming Enforcement, the casino regulatory agency within the Department of Law and Public Safety. Rebuck was appointed as Assistant Attorney General on May 9, 2011 by Attorney General Paula Dow. Rebuck was confirmed by the New Jersey Senate on January 9, 2012. He was officially sworn in on January 24, 2012. Rebuck’s tenure at the Division began with the examination of the entire set of casino regulations to ensure consistency and to eliminate redundancy and unnecessary mandates. This task was the result of Governor Chris Christie signing into law Senate Bills S-11 and S-12, which significantly altered the landscape of Atlantic City and made the Division the principal gaming regulatory agency in New Jersey. A complete new set of regulations was adopted in December 2011. Rebuck also spearheaded specific initiatives in the area of the Tourism District and the Clean and Safe mission established as part of S-11 by establishing an aggressive policy to enhance casino security and surveillance operations and in excluding individuals from casino hotels who repeatedly disrupt casino operations or threaten the safety of casino patrons and employees. Rebuck was instrumental in this initiative and the number of persons added in one year to the Division’s exclusion list reached its highest level ever in the history of the agency. Since his appointment, Director Rebuck actively pursued legislation to offer alternate forms of gaming in Atlantic City and revenue to the State. In the area of sports betting, Governor Christie signed a bill authorizing sports betting in Atlantic City casinos and New Jersey Racetracks. Under Rebucks’ direction, the Division promulgated and adopted regulations on October 12, 2012 allowing sports betting. The filing of litigation and resulting court case and the diligence in pursuant of sports betting has brought world-wide attention to New Jersey. Rebuck has also been closely involved in the legalization and implementation of Internet gaming in New Jersey. With his foresight, proposed Internet gaming regulations were able to be adopted and become effective in October 21, 2013, less than three months after Governor Christie signed the law legalizing Internet gaming in New Jersey. Under Rebuck’s direction, the Division also developed regulations which authorized Atlantic City casinos to offer fantasy sports tournaments, mobile wagering, and interstate wide-area progressive slot play. Rebuck's understanding of the casinos vast customer base and their ability to have contest winners utilize the casino cage to accept entry fees and pay out winnings was the catalyst for the development of the regulations and provided another amenity beneficial to the casinos and their customers. 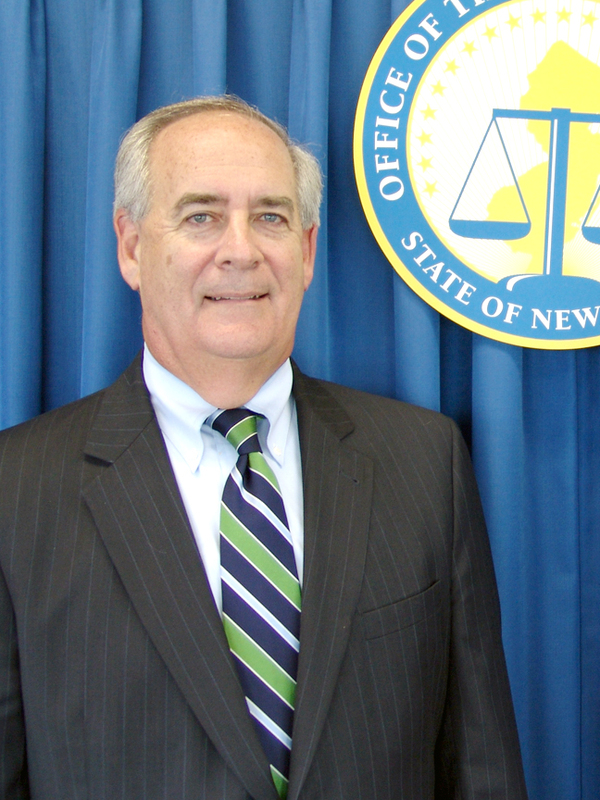 Rebuck previously served as an attorney for 23 years as a Deputy Attorney General for the State of New Jersey and specializes in policy guidance and regulatory reform. He was assigned to the Governor’s Office as a Senior Policy Advisor to Governor Christie in February 2010 and assisted in the Governor’s initiative to reinvigorate Atlantic City and participated in overseeing regulatory reform efforts as a member of Governor Christie’s Red Tape Review Group. Rebuck joined the Department of Law & Public Safety in January 1988 as a Deputy Attorney General. He was instrumental in providing legal advice in the review of programs and operations within the department and assisted in the evaluation of the performance of various agencies in accomplishing their mandated governmental role and in the development and implementation of corrective action. Rebuck earned a bachelor’s degree from Gettysburg College in 1974. He earned a master’s degree in higher education administration from the University of Vermont in 1978, and earned his law degree from Delaware Law School of Widener University in 1986. Rebuck was Associate Dean of Student Life at Ursinus College from 1978 through 1986, and was Assistant to the President of Radford University from 1986 through 1988. He is a member of the Pennsylvania and New Jersey Bar. Rebuck was recognized by the International Masters of Gaming Law as their 2013 Regulator of the Year.